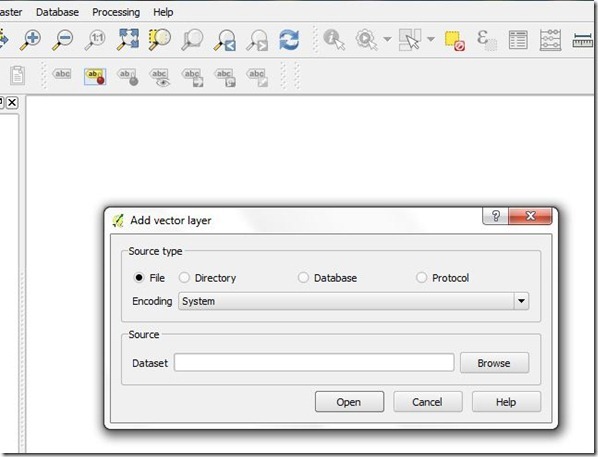 Enter stage right: QGIS: A Free and Open Source Geographic Information System. 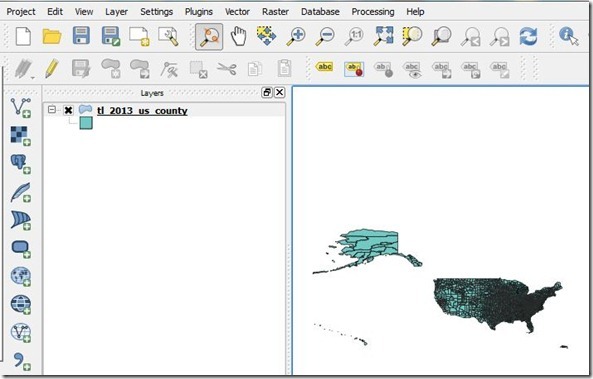 QGIS is a powerful mapping system that is both open source and community supported. If you are, like me, a neophyte to GIS, it is well worthwhile to spend some time on the QGIS website looking at their documentation and different levels of support. 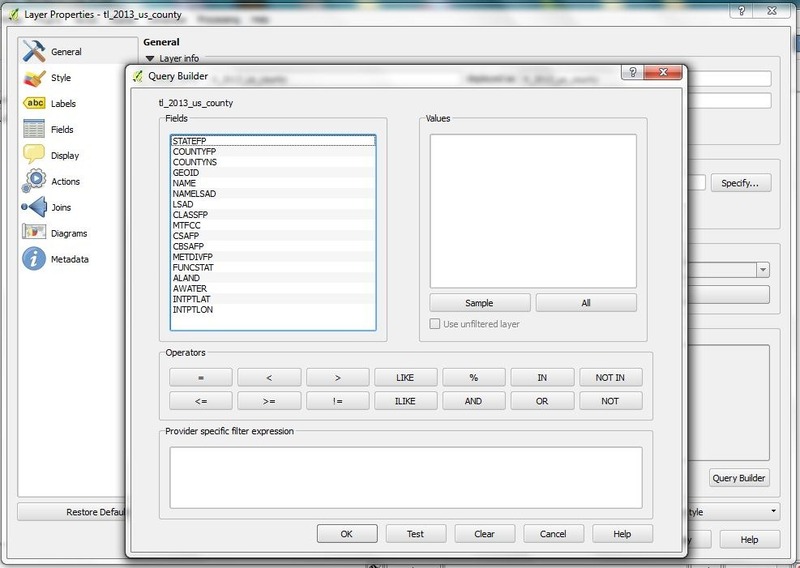 An Internet search on QGIS will also result in many hits and other sources of support. 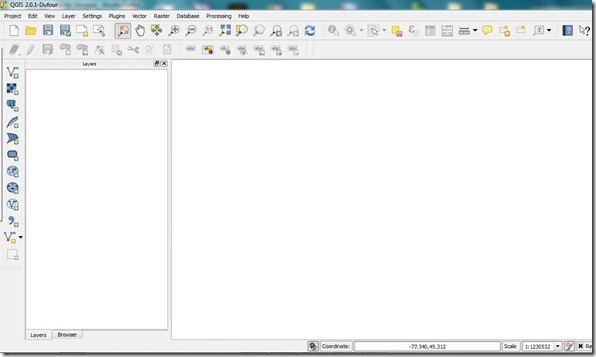 What follows is the first of several tutorials of how I got QGIS to produce the map I needed. I need such maps only two or three times a year, so this tutorial avoids recreating that nasty wheel in several months time. However, I am not a GIS expert by any means. There are, undoubtedly, more elegant ways to accomplish the task documented here besides my duct tape and bailing wire approach. If you follow the steps in this, and subsequent, tutorials I strongly recommend you proof your work! It is very easy to totally corrupt data while presenting a perfectly normal looking map. The result of such an error is a map that might present the exact opposite of what the data really says. The QGIS Standalone Installer is available free at the QGIS website by clicking on the Download Now button. I grabbed the 64bit, v2.0.1 for Windows 7. The software installed like any other Windows program. The download and subsequent install did require patience. It is a large file, on the order of 180+ megs, and takes awhile to download as well as install. The QGIS install offers the opportunity to download several example data sets. Normally, I go ahead and grab things like this when I’m learning a new system. However, the files are very large, so I skipped this step. Remember those counties I wanted to color code? For that, I needed ESRI shapefiles. There are many sources of shapefiles. The United States Census Bureau provides TigerLine Shapefiles as well as many other GIS data products. For this project, I used the 2013 TigerLine Shapefiles via their ftp site. The Census Bureau also provides a web-driven download site. In this particular example, Counties (and equivalent) provides the same county shapefiles for the entire US as the FTP site. Many state governments now maintain their own GIS programs and offer free data, including shapefiles, on their websites. For example, an Internet search for Vermont shapefiles resulted in a hit on Vermont Center for Geographic Information. A bit of nosing around on the website, and I wound up on their Geospatial and imagery page with all sorts of goodies. The county shapefiles were under the Boundaries (Admin-Political) theme. I’ve found similar pages for other states as well. Many of these sites have already done some of the heavy lifting of database management by incorporating such things as census data and the like in the shapefiles. 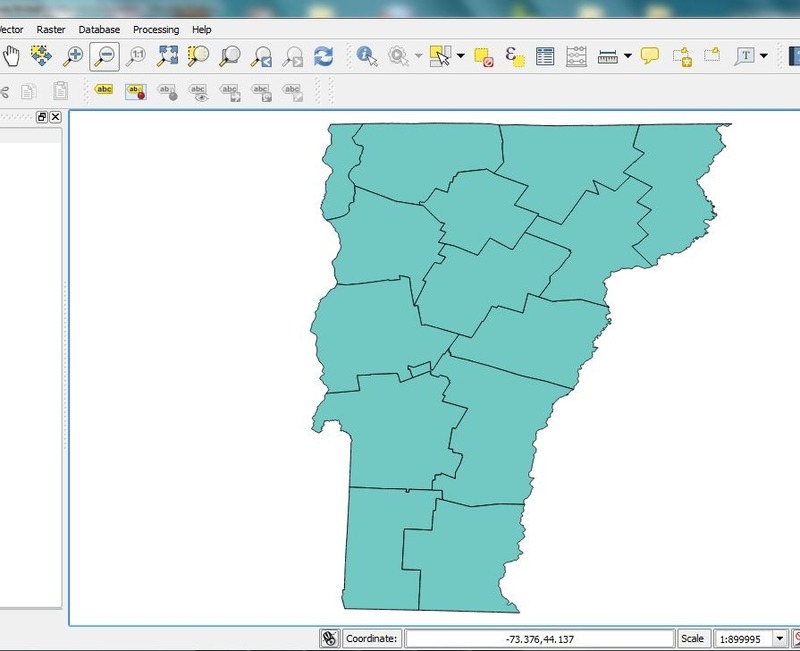 In this tutorial, I stuck with the TigerLine shapefile for U.S. Counties. I downloaded the zip file and extracted it to a subdirectory in my Documents area. Add the US County shapefile as a vector layer. Using the default settings, Browse and navigate to where you extracted your shapefiles and select, in this case, tl_2013_us_county. If, like me, you like to be able to see file extensions, it will have a .shp ending. Thanks to a tip from Nathan in the comments, I learned that you do not have to unzip the shapefile. 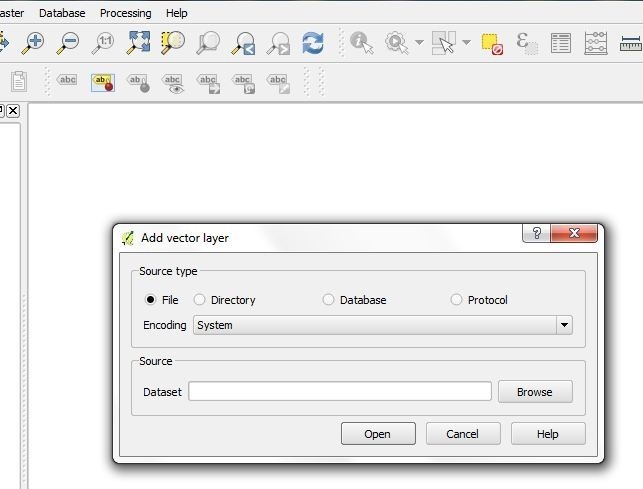 You can also simply drag and drop the entire zip file into the QGIS map canvas. 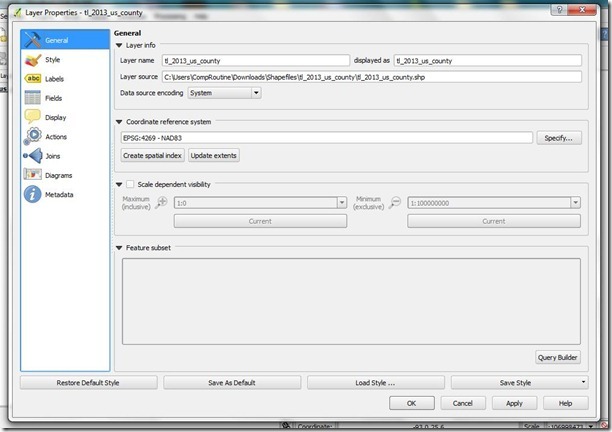 Once done, you can select the tl_2013_us_county.shp vector file and then click OK. If you are curious at this point and want to play around with the file, you can zoom in with the zoom in-out buttons and the information button to take a look at various counties around the U.S. However, we need to filter these results down to a manageable chunk. Having the county-level maps for the entire United States is all well and good, but it is a bit…busy. Time to carve out just one state: Vermont. 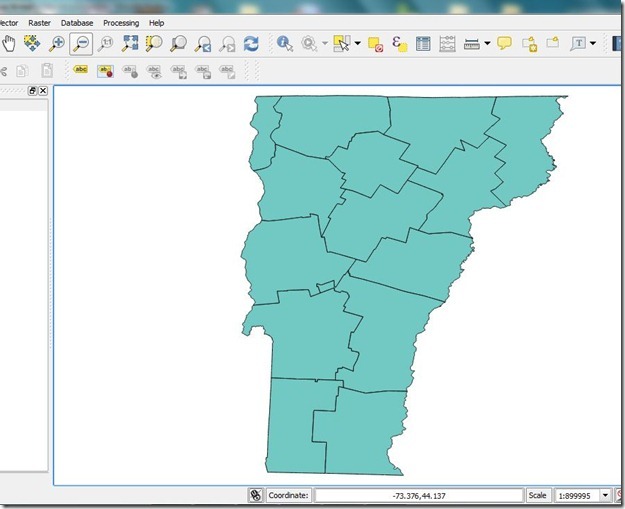 The Green Mountain State only has 14 counties and this number will make it easier to demonstrate working with county-level data later in the tutorial. 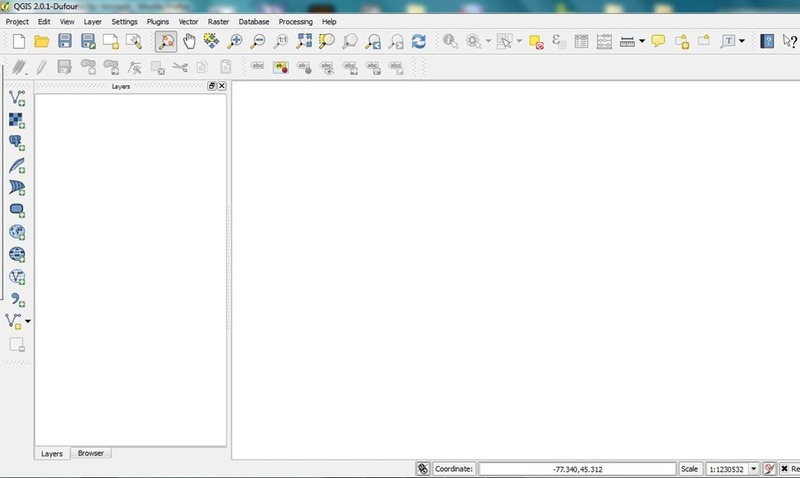 I’ve noticed, sometimes, some of the QGIS boxes are too big and the bottom row of buttons cannot be seen. If this happens, use the cursor to grab the top of the box and make it a bit smaller. You should then be able to position the box so that you can see all of the command buttons. 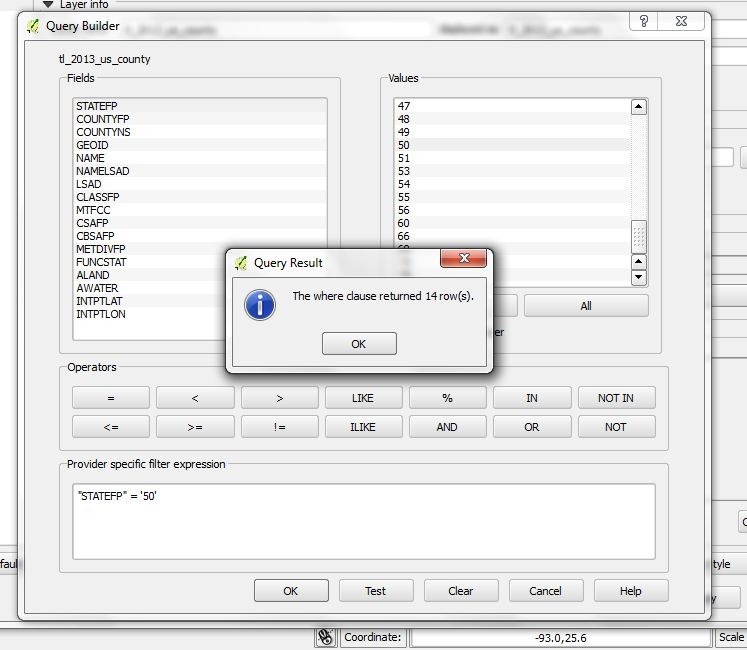 click OK in the Query Builders dialog box. Save the project by going to Project and Save as. The save routine is pretty much the same as with any Windows software. 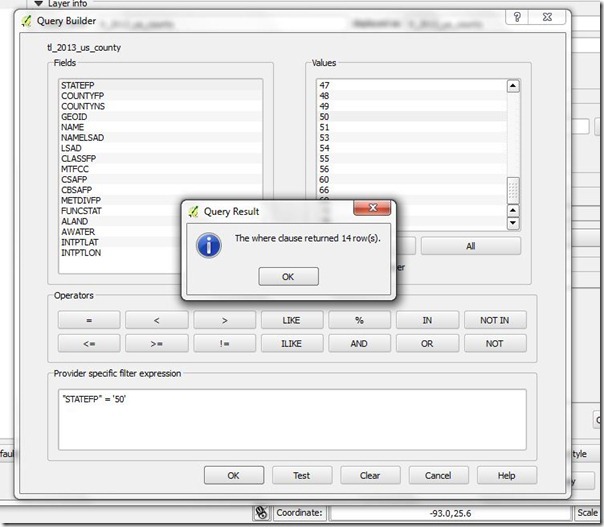 However, notice that the default directory is buried in the Programs area; so, you might want to navigate to your ‘My Documents’ and create a subdirectory there for QGIS Projects. That way, the project will be easier to find when we come back to start entering data and mapping the results. If you have any problems or know of better ways to accomplish the task shown above, please share in the comments.